– It seems that not a day goes by that I don’t get a compliment about my Pad & Quill bag. I use it to carry my Microsoft Surface Pro 4 and my ASUS ZenPad Z8. 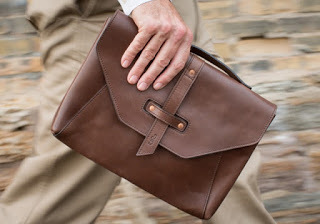 Stephen Hans, master of Product Design at Pad & Quill, describes this beautiful leather bag as “Mad Men meets the Wild West.” This slim bag is made from full grain USA steer leather and lined with 24 oz. filter twill waxed canvas. I’ve been a long time fan of Pad & Quill’s products including their phone cases, briefcases and luxury leather bags and now they’re also producing handsome watch bands for the Apple Watch.